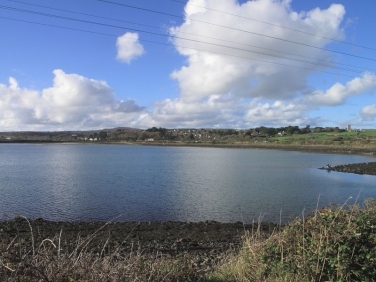 These attractive ducks are rare passage migrants and rare winter visitors to Cornwall. So this one turning up last week at Carnsew Basin or Pool on the Hayle Estuary was a real bonus, particularly as it was a well marked male and came sufficiently close for a photo with a 400mm lens. Despite the low winter sun creating some cracking light it wasn’t straightforward getting this shot – whenever is it? 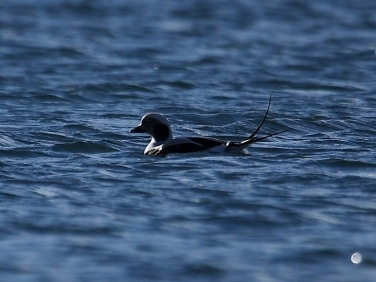 As well as often being too far out for anything other than record shots it also spent alot of time underwater and once surfaced wouldn’t remain there long. There were also some clouds about and when, after a long wait, it actually did come close enough, yes, you’ve guessed, a cloud moved over the sun! Anyway, it was still the best photograph of this species that I’ve ever managed. Incidentally, the water really did come across that colour. No computer colour saturation has been applied to this image. 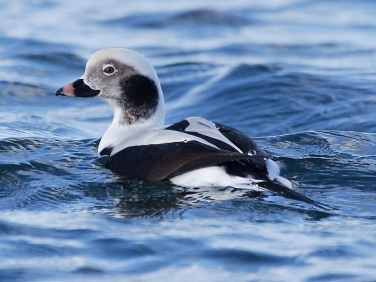 The identification of the male Long-tailed Duck in late autumn to spring plumage is not difficult, with no similar looking ducks to be seen in waters around the British isles. However, this is the first wintering male that I’d ever managed to get good close ups of in the UK and what surprised me was that the most conspicuous identifying feature wasn’t the long tail after which it derives its name. 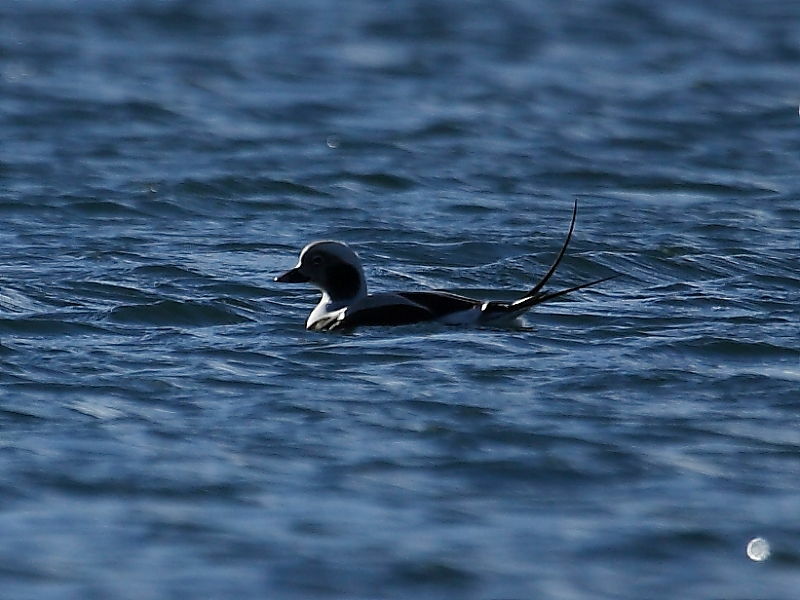 In fact, for most of the time, I had great difficulty in even seeing the extended tail feathers as they lay flat on the water and were only briefly lifted up when the duck dived. The key identifying feature was the head with its black cheek smudge, pink and black bill and light grey patch around the eye, which stood out clearly even at distance.